I come from a long line of tea drinkers. My paternal Great-Grandparents, both from Ireland, used to have a pot of black tea on the stove almost constantly. The tradition carried down to their daughter (my Grandmother) and my Aunt Wendy, who introduced me to adding milk and sugar to my tea. My Mother has always been a tea (as well as coffee) enthusiast and kept up the tradition in our home. She loves Chinese teas and introduced me to Harney & Sons, a renowned tea company with a massive inventory, early on. Below you will find a list of my favorite Harney teas, many of which I discovered by trying the free samples Harney sends with each order. *You can also order samples too! As you will notice, most of the selections listed here are black teas, which I generally gravitate toward. If you are interested in more informational posts regarding tea (including history, how-to, etc), leave a comment below. Also, let me know if you’ve had any of these teas before and what you think! Lastly, I will be sharing some of my other favorite teas as well as tea parties in upcoming posts! The SoHo Blend is a flavored black tea with chocolate, coconut, vanilla, and amaranth petals. 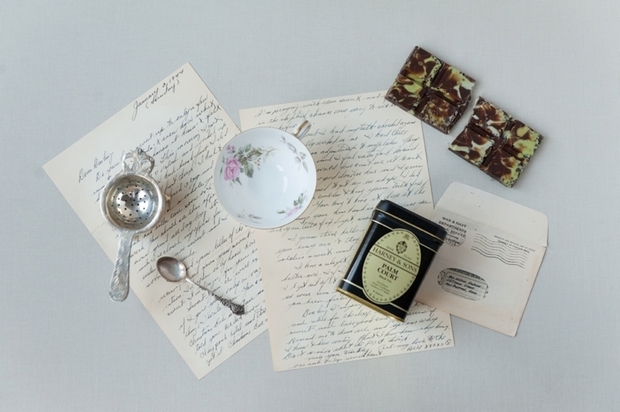 As with most teas from Harney & Sons, it comes in a beautiful tin filled with sachets. It also comes loose if you prefer to steep your own tea. I admit, I am not a coconut fan. At all. I was weary of this tea but it had really great ratings so I decided to give it a shot. Also, the tin was so chic that I decided it wouldn’t be a total waste if I hated the tea. Makeup brush holder?! Why not? Turns out, this tea is AMAZING. The coconut flavor is very subtle and it is one of my favorites. I drink SoHo with milk & sugar though I imagine a lot of people may like it as it is or with just a bit of milk. You can find SoHo HERE. Paris is a fruity black tea with vanilla and caramel flavors, and a hint of lemony bergamot. Bergamot is a Mediterranean sour orange, in case you were wondering. The skin yields an oil that is used in perfume, cosmetics and TEA! Bergamot oil is used to flavor Paris and is the signature ingredient in Earl Gray tea. I am obsessed with this tea and take it with milk & sugar. I’ve given out LOTS of samples of this tea and the feedback is always wonderful. I can see why it is one of their best sellers. You can purchase the decorative tin of sachets, a box of individually wrapped bags (perfect for travel), loose tea, Keurig pods, a DECAF version (still can’t believe it) as well as an herbal, rooibos version. *I’m not a fan of rooibos fan so I can’t speak to how this version compares but would love to hear from someone who has! 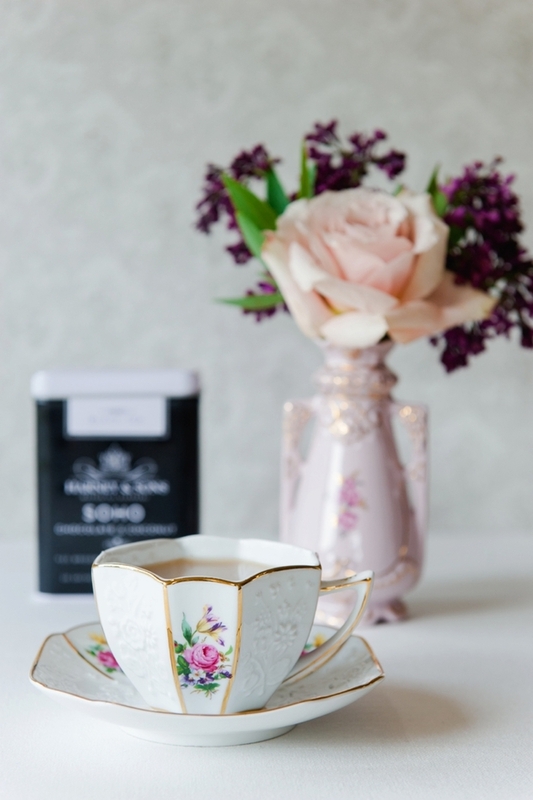 Commissioned by Historic Royal Palaces to create this special tea, Royal Wedding is a blend of Chinese Mutan White tea buds with almond, coconut and vanilla and an abundance of pink rosebuds and petals. “In 1660, the 17th-century diarist Samuel Pepys had his first ever “Cupp of Tee, a China drink’, then only introduced to Britain. Catherine of Braganza, Charles II’s tea-drinking Queen, made it fashionable. Queen Anne would often enjoy a cup of tea at Hampton Court Palace. Also, the double wedding of Queen Charlotte’s sons at Kew in 1818 was celebrated with a tea party. This a unique tea that I prefer without milk. We served it at our wedding and it was a huge hit! Find it HERE. Vanilla comoro is a sweet (almost roasted) tea that packs in a lot of flavor. It is the decaf version of Vanilla Black tea. 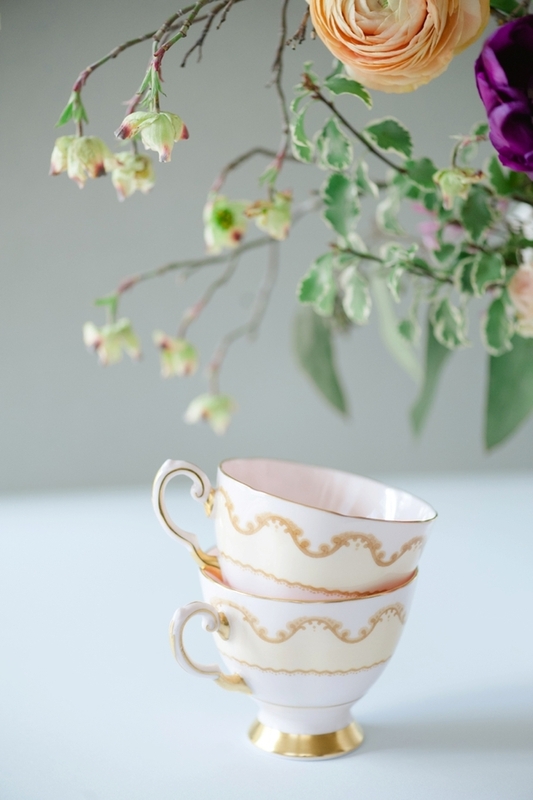 I love drinking this tea at night with or without milk and sugar in one of my pretty teacups. You can find vanilla comoro in tin form (sachets), loose, or in little round tagalong tins HERE. Palm Court, created for The Plaza Hotel, is a blend of four teas; Keemun, Assam, Ceylon & Formosa Oolong. This is a lovely, light black tea with a slight green tea flavor. It is tasty as is, with sugar and/or milk. You can find it loose or in sachets HERE. Here are a few other teas I sampled recently! Capri is a smooth & aromatic flavored black tea, infused with dried figs, tart lemon and a hint of vanilla. If you don’t like fig, I would steer clear of this one. When I tried it, I added a bit too much sugar but found it to be a lovely afternoon/after dinner tea. Next time I try this one, I will try it without sugar and perhaps a splash of milk. I’ll also imagine I am catching some Italian rays! Boston is a black tea flavored with cranberry, vanilla & almond. I LOVE vanilla & almond flavored teas so this one appealed to me right away in my quest to expand my Harney & Sons palette. I am usually suspicious about berry flavored teas since they usually taste fake to me but the cranberry addition to this tea compliments the other flavors well. Another black tea blend (are you sensing a trend here?) I recently tried is Florence. Indulge in its blend chocolate & hazelnut flavors. I read some interesting reviews suggesting to add a bit of Florence to a pot of Irish Breakfast or mixing with the Indian Spice Chai. I am looking forward to both of these combinations! This is a delicious Chinese green tea with lemongrass, blueberry, and vanilla and can be served hot or cold. I enjoy this iced in the summertime. Chocolate Mint is a yummy Chinese black tea with a delicious aroma of peppermint leaves and natural chocolate flavor. Subtle yet sweet, this is great as an after-dinner tea. Great with milk!